Some plastics have been known to leak plasticizers (bisphenol and phthalates) into the food they contain, especially when heated. Because such compounds are suspected of being endocrine disruptors it seems best to avoid eating hot food from a plastic container. Recently bamboo bowls, cups and plates have become available. As far as I can tell these are made from some kind of composite material which contains bamboo fibers and something that glues these together. The only information is that it's: renewable, dishwasher safe, bio-degradable (the last two claims seem contradictory), food safe, but not suited to be microwaved. Is it possible that these kitchen-wares are safer than other plastic bowls, plates and so on? Is it possible to even assess the risks? Inspired by the other answer and the comment to my question, i have dug a little deeper. The tableware in the picture is sold by a company called Zuperzozial and made from bamboo and corn reinforced with melamine resin. Many similar products are sold, almost always without a brand name and always without any specification of the actual material. 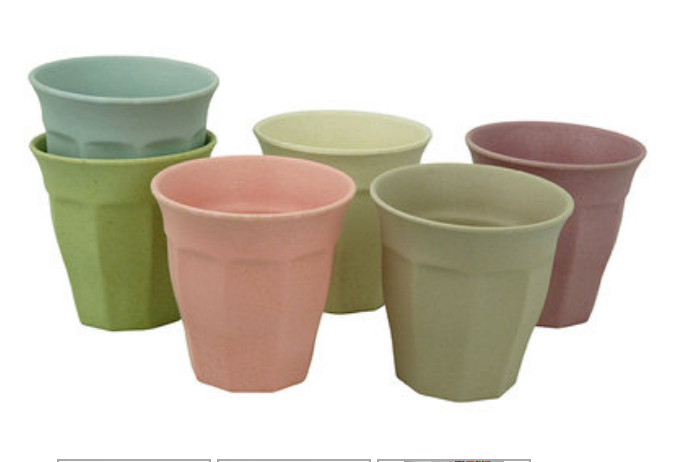 So I will answer my question for this specific set of cups, there is no way to tell if the answer holds for 'bamboo' tableware in general. Melamine from tableware may leak into the food, especially when heated, according to the FDA. It is ok to serve cold drinks in a melamine resin cup. The claim that these cups are micro-wave safe is not true. As for the amount of BS of the rest of the marketing claims: bamboo and corn are renewable sources. But i'm not sure how degradable a resin is. Not the answer you're looking for? Browse other questions tagged everyday-chemistry polymers toxicity plastics or ask your own question. Why plastic sheets contract when heated? Why does plastic tear easier when you pull it quickly? Does the plastic cup PETE 1 material leak toxic material if subject to boiling water even for part of a minute? What is the name of the crinkly plastic used in clear parts of envelopes?